Jessica Campbell has played third bassoon and contrabassoon with the Tucson Symphony Orchestra since 2008 and is a regular freelancer in southern Arizona. Along with colleague Cindy Behmer, Jessica is half of the Kontra-Cor duo, a unique ensemble consisting two double reed players: one oboist/English hornist and one bassoonist/contrabassoonist. Kontra-Cor has commissioned and premiered new works for the ensemble and has performed on two continents. Additionally, Jessica has performed with the Arizona Opera, Tucson Chamber Artists, the Springer Opera House, and the Tallahassee, Albany (GA), and Columbus (GA) Symphonies. Currently a doctoral candidate at the University of Arizona, Jessica served as Teaching Assistant in the bassoon studio and performed with the Arizona Wind Quintet during the 2005 sabbatical leave of Dr. William Dietz. She received the Bachelor of Music degree from Columbus (GA) State University and the Master of Music degree from Florida State University where she also was a teaching assistant. 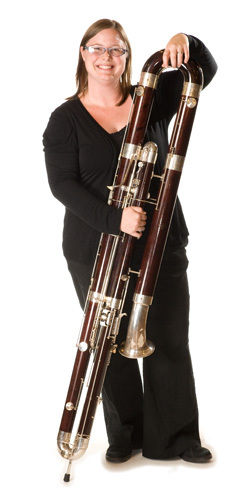 She currently teaches instrumental music at BASIS School in Oro Valley, Arizona, teaches a studio of bassoonists and contrabassoonists in southern Arizona, and maintains a small bassoon reed-making business. Jessica is a member of Pi Kappa Lambda, Mu Phi Epsilon, and the International Double Reed Society. Her principal teachers include Ronald Wirt, William Ludwig, Jeffrey Keesecker, and William Dietz; she has performed in master classes with Michael McCraw, John Steinmetz, Jeffrey Lyman, Robert Williams, and William Waterhouse. Jessica resides in Tucson with Greg (her husband) and Luna (the most beautiful cat in the world) and spends much of her free time chiseling, scraping, and whittling through mountains of bassoon reed cane. They Might Be Giants, Ravel, The Beatles, Esquivel, Moxy Früvous, Pink Floyd, Brahms, Pink Floyd, Hovhaness, Green Day, The Bassoon Brothers, and of course… Journey. One of my first experiences as a performer was at All-State Orchestra in ninth grade. Everything that could go wrong did… my music was stolen, I fell and scraped my hands and knees, and I was even left behind for the dress rehearsal because they decided to leave earlier than the meeting time! With all these unfortunate events occurring, one amazing thing was clear to me: I was part of a group that was making music and bringing joy to the audience. That is when I decided that I wanted to be a musician. Honestly? Because it looked cool! I started on clarinet, so when a bassoon student transferred to my school in seventh grade I knew it was meant to be. Love at first sight… as some may say. I love performing Brahms. The energy and passion behind his harmonies and melodies can’t be beat. Specifically, Brahms’s Third Symphony. I teach music and art classes at BASIS Oro Valley. Other than that, I like to play with my gorgeous kitty Luna. When we have time, my husband and I like to make nice dinners together… he is quite a good cook! I attended Columbus (GA) State University for my bachelor of music degree in bassoon performance. I then graduated from Florida State University where I was a teaching assistant for the bassoon studio. I am currently finishing my DMA degree (comprehensive exams are completed) at the University of Arizona. Christopher Columbus park is quite nice… there is a lake! I like a couple different restaurants in town: El Guero Canelo, Café Poca Cosa, and El Charro. Mount Lemmon is always a nice quick get-away from the city.